Temple forward Justyn Hamilton dribbles the basketball against Belmont guard Dylan Windler (right) and center Seth Adelsperger during the first half. 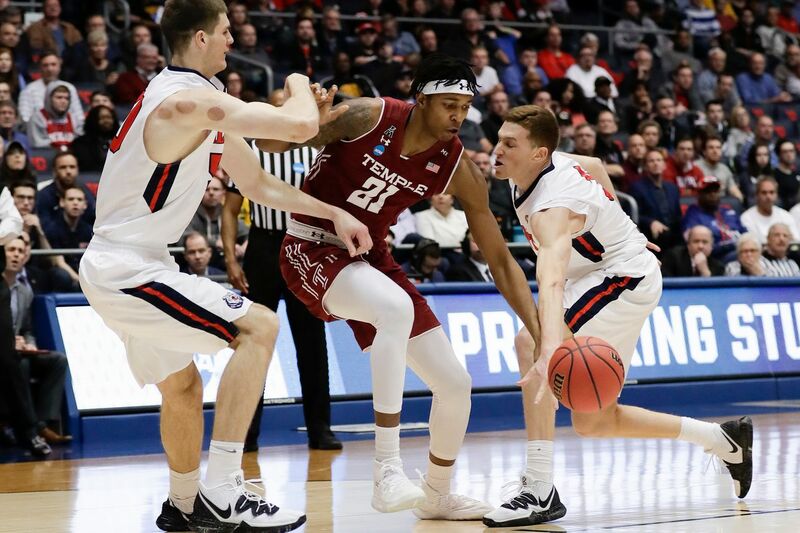 DAYTON, Ohio — The contrast between Temple and Belmont shows why the Owls season has ended and the Bruins are still playing. Belmont’s 81-70 win in an NCAA Tournament play-in game Tuesday night at the University of Dayton Arena was the latest example that the Owls lived this season by such a fine line, that if the smallest thing went wrong, they would have trouble recovering. Simply put, Temple needed scoring from its big three of senior guard Shizz Alston, junior swingman Quinton Rose, and sophomore guard Nate Pierre-Louis. All three had their moments but couldn’t sustain them. Alston scored a team-high 21 points but seemed to run out of gas late in the game, making just one of his final seven shots. His play had given the Owls a five-point lead with more than 11 minutes remaining. Before Temple could blink, Belmont was up by eight, then 10, then 11. That was it. The Owls didn’t have enough comeback in them. “If I had to do it over, I would get my teammates more involved once the shots stopped falling, but I was so locked on just trying to win. If I had to do it, I would have probably turned down some of the shots I took,” he said. Rose finished with 10 points, and was 4-from-13 shooting. Pierre-Louis, who had a stellar defensive performance, struggled for most of the game before hitting some late shots. He scored 13 points on 5-for-12 shooting. Pierre-Louis did a masterful job on 6-foot-8 Dylan Windler, who had just five points on 2-for-7 shooting. That’s more than 16 points less than his scoring average. But Belmont has built the type of team that doesn’t need its star to be a standout every night. Fellow first-team all-Ohio Valley Conference guard Kevin McClain had a game-high 29 points, and 6-11 freshman Nick Muszynski, the Bruins’ third first-team all-conference player, added 16 points and hurt the Owls inside. Freshman point guard Grayson Murphy added nine points and six assists. Belmont entered the game second in the nation in scoring (87.4 ppg. ), but Temple didn’t allow the Bruins to constantly get in their favored transition game. So the Bruins took what the Owls gave them and ran some impressive half-court sets. The more versatile and more talented team won this game. Belmont was a 3 1/2-point favorite for a reason. Moving forward, while Alston and center Ernest Aflakpui will be difficult to replace, the future should be bright for the Owls. Rose, a 6-8 junior who averaged 16.3 points, should be the leading offensive player. The Owls will have a strong rising-junior class of Pierre-Louis, forward-center Justyn Hamilton and forwards J.P. Moorman and De’Vondre Perry, who have helped the team more on defense than offense. Monty Scott, a 6-5 guard who sat out this season as a transfer after averaging 17.3 points as a sophomore at Kennesaw State, should greatly help the offense. There are also incoming 6-4 freshman guard Damian Dunn, who could compete for time, and two rising seniors: guard Alani Moore and 6-11 Damion Moore. Also back will be junior guard Quentin Jackson and freshman forward Arashma Parks, who didn’t play this season because of injury. As all know, this was coach Fran Dunphy’s final Temple game, with associate head coach Aaron McKie taking over the head-coaching duties.